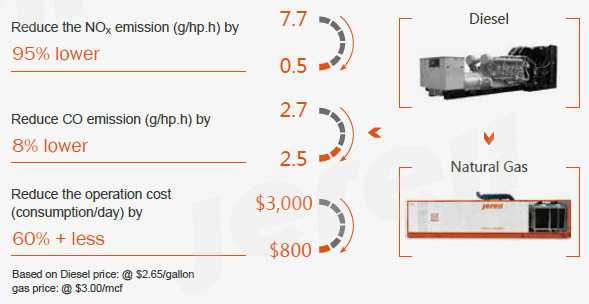 ﻿ Associated Petroleum Gas Utilization_Products & Services_Jereh Combined Energy Co., Ltd.
APG has taken a large proportion in the oilfield production, which was burned and discharged to the air in the past years for safety consideration. The result was wasting energy and polluting the environment. At present this issue has been given extensive attention as APG is also a kind of precious clean energy. Through the comprehensive utilization, it can be used to generate power and produce CNG/LNG, which can save energy,reduce emission reduction and create huge economic benefit. ◆ There are more than 2,900 units GE gas gensets operating worldwide and the total installed capacity exceeds 2,000 MW. The application of gas genset for drilling is actually not a new technology. As the strengthen of social and environmental responsibility of oil & gas drilling companies, as well as the unstable supply and the price soaring of diesel fuel, this technology has been increasingly showing its unique superiority and arising more and more attention. ◆ Besides natural gas/LNG/CNG, it is also applied to many other gases such as well field gas, flare gas etc.